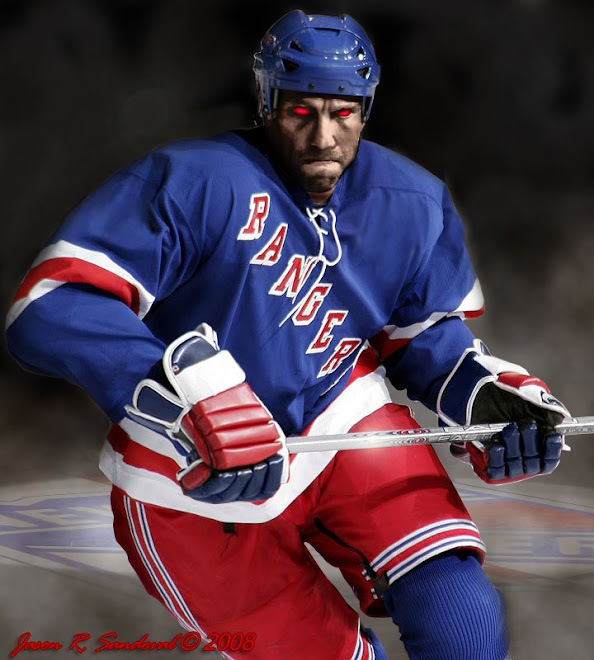 The Dark Ranger: Congrats Blueshirts! The first round against the New Jersey Devils is over. I haven't posted, as life always has a way of sucking away needed hockey viewing!!!! Obviously, The New York Rangers won it in five games and articles galore are, and only for a moment, putting Sean Avery over Marty Brodeur. For now, he earned it. Short and sweet, The Dark Ranger couldn't be more thrilled with the efforts of Henrik Lundqvist, Rangers' old and (mostly) young, and I might even give Coach Tom Renney a thumbs up. Hey we're both still alive for that Rangers-Avs Stanley Cup series, we want. Congrats and let's continue rolling. 1) We guess Lundqvist will be just fine finishing behind Brodeur in June's (Vezina) award ceremonies after finishing(and playing better) ahead of Marty when it counts the most! 2) Now on to the hard series. The Penguins/Habs will not be quite as easy to knock off! faux...sid wasn't my first choice, roberts scares me as well.